"Ten years ago, I think that Eddie Van Halen used to listen to Ollie Halsall a lot." Assuming this to be correct - which is more than likely - the source material almost certainly comprised two then already 10 year old recordings by UK band Patto. Now, 25 years since they first appeared, original producer Muff Winwood has remastered these stunning and rare Vertigo albums as a superb 2CD set - "A Sense of the Absurd" (Mercury 528 6962) - including 30 minutes of previously unreleased material. Vocalist Michael Patrick `Patto' McCarthy, guitarist Peter `Ollie' Halsall, drummer John Halsey & bassist Clive Griffiths survived such diversities as Felder's Orioles, The Breakaways, The Chicago Blues Line and eventually Timebox - already a 60's club legend and favourite of the Beatles and other rock elite. They played a unique blend of jazz-rock, including lengthy free-form excursions far beyond the capabilities of their peers. Perversely, Timebox had a string of MOR releases - including a version of the Four Seasons' `Beggin' which actually made number 30 in the chart of July 1968 - featuring Halsall on vibraphone. He had totally mastered this unusual and complex instrument at the age of 15 by practising on strips of paper - completely typical of someone who later spent his share of the first album advance on a Persian carpet and repaired broken guitar strings by tying knots in them! Halsall's first instrument was the drums and he hadn't touched a guitar with any professional intent until late 1967 when the role was thrust upon him in a personnel reshuffle. The progress to the standard demonstrated by the recordings from 1970 & 1971 contained in this album is nothing short of incredible. In 1970, Timebox secured a deal with Vertigo and were at last able to pursue their own material. With an eye on the lucrative European and Far East markets it was decided to adopt a new name. Surnames were in vogue but `Griffiths', `Halsall' & `Halsey' were improbable in other than English. Mike's nickname `Patto' seemed to fit the bill. Patto were a legendary live band. They never had a stage act nor even a set list. It was totally spontaneous and insane - spiced liberally with Python-esque humour. Consider for a moment: `The Dwarfs' Chorus' - approximated visually by kneeling on shoes; `Strangers in the Night' in 5/4 time - achieved by an added expletive in each bar;. `Admiral' Halsey crooning 50's pop standards; An `unplugged' `Shakin All over'; The Twist Competition with entries by band members - including Ollie's `Amoeba Twist' (which involved lying prostrate on the floor and wriggling in vague suggestion of a single-celled organism). For three years they took this surreal circus round the clubs and pubs of Great Britain, embarked on several European sorties and even managed a US tour supporting Joe Cocker. Luckily, however, this mayhem merely formed a back-drop to the unique Patto/Halsall compositions now resurrected on this record. Halsall was his own worst enemy in any perceived struggle for popular acclaim. The best illustration being his response to the adulation he had received for the first two albums - which was to play piano almost exclusively throughout the follow-up `Roll 'em, Smoke 'em, Put Another Line Out'! He was the epitome of the musicians' musician - shy, unassuming and somewhat bewildered at the attention he generated. It is difficult to appreciate the impact he had on the early 1970's rock scene. 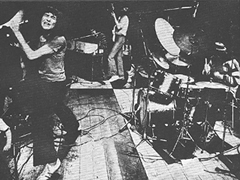 In back rooms of sweaty pubs you could, on occasions, spot some very big-name players standing `jaw-dropped' in amazement at the sight of a short-haired (for the times) left-handed guitarist in a tweed jacket and striped jumper hiding in the shadows behind the vibraphone (on which he doubled until John Halsey demolished it during a `freak-out' in 1971) and playing a white Gibson SG custom guitar. Speed isn't everything - as any music store proprietor wearied by every kid in town widdling their Saturday morning Satriani licks will testify. Unfortunately, not only was Ollie probably the first to produce fluid, lightning `hammer-on' runs rather than the staccato plectrum strokes of conventional jazz players, he was at once the most creative, sensitive, humourous, tasteful and melodic player that ever trod the planet.Listen to the solo on `Give It All Away' included here and tell me if you've ever heard technique so intelligently and precisely delivered. In 1973, totally disillusioned by the paradox between press adulation and lack of commercial success, they split. Mike died in 1979 after one final brave attempt at the big-time with Boxer. Halsey became Barry Wom for the Rutles (in which Halsall played guitar and supplied Dirk McQuicklys vocals, slightly speeded up). Halsey and Griffiths - a formidable rhythm section - supported various acts until a road crash left Clive hospitalised to this day. John eventually ran a pub in Suffolk and still plays. Ollie had joined Jon Hiseman's Tempest and then Kevin Ayers' backing band where he stayed, on and off, for an incredible 18 years until his own tragic death in 1992 following yet another low-key European tour. These recordings come from an earlier, and no doubt happier, era. It has been remarked that, in the overall scheme of things, there are two albums anyone who thinks they can play guitar should hear. One is `Are You Experienced' the other is `Hold Your Fire' (1971) - included here together with the debut `Patto (a.k.a. `Anarchy') from 1970. 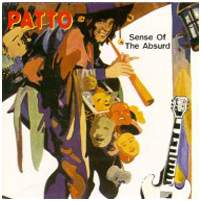 Patto purveyed a unique sense of humour, an undoubted sense of rhythm, melody & harmony but, perhaps above all, a true `Sense of the Absurd'.